Summary: Crazy for bags? Take a look at the elegance that a Tod's bag can add to your everyday ensemble. The love that women have for clothes, shoes and bags is not a secret. Some of them are even willing to spend most of their fortune just to prove their fascination and devotion to these material things. Fashion, indeed, is "passion" to most women. And those who care the least about price as long as they are provided with nothing but the best and highest quality fashion products would not bother paying for highfalutin price tags. Branded bags exude significance and elegance, and you can bet that a lot of people want those two words to be associated with themselves. Some may wonder how people, especially women, can have the courage to spend up to thousands of dollars just for branded bags, clothes, shoes and accessories, among others. Well, the answer should not be so hard to pin down—a branded product is also a girl's best friend just like diamonds. One of the brands that currently top the list of women's preferences for handbags is Tod's. Women who are into simple yet elegant designs and styles in bags definitely love the Tod's collection and you will never find someone who would say it is not recommendable, unless of course they do not know the brand. But for those who are just starting to explore the beautiful world of Tod's, this article will let you know more and help you understand why it is getting such high acclaims. Tod’s Group is a company originally based in Italy and is known for their production of shoes, bags, and other leather goods. As of late, the group is led by world-renowned personality, Diego Della Valle. Originally, Della Valle’s father, Dorino Della Valle, was the one who developed the business that is now known in the fashion industry as Tod’s. Dorino started a shoemaking business in a humble basement in the last quarters of the 1920s. Diego, being the elder son in the family, was given the opportunity of expanding the business until it has been turned into a factory huge enough to produce shoes for distribution and sale in the 70s in many department stores in the United States. When the next decade came, Diego introduced new marketing strategies while keeping the handmade production process. The business expanded to introduce the brands Tod’s Fay and Hogan. In the middle of 1990s, Roger Vivier, a famous designer of shoes, was hired to develop more innovative and not to mention, lovable set of shoes. In 2003, with the help of Bruno Frisoni, an Italian designer, who was hired as the creative director for Vivier, the business bloomed further to venture in other lines of fashion—from shoes to bags. A Tods bag may not be considered by some as exciting, but definitely, it is something that anyone would agree to be simplistically beautiful. 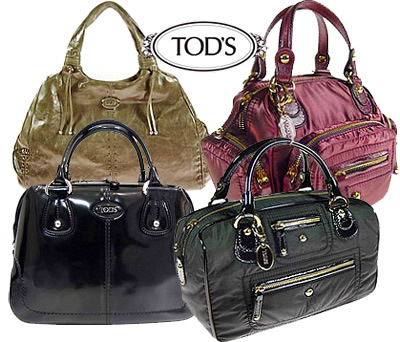 A Tods bag is something that you can wear with anything at any time, place or event. Because of its minimalism and simplicity, you can never go wrong in carrying it with you in a casual, normal office day or a special, formal event. For instance, the Tod’s Ivy Sacca Media Shoulder Bag performs what a bag should practically do—secure your belongings and make sure that all you need are stuffed inside it, at your easy reach. And yet, it is a thing of simplicity intertwined with quality and exact details that all in all equate to elegance and beauty. The material of the copied bag itself is enough to let anyone know that it is of high value. But if you are someone who would appreciate a bit of the more daring designs, you can also get a Tods bag with fringes. The Tod’s G-bag Frange Media is a fringy it bag yet it is simply elegant nonetheless. It is not exaggerated yet you know that its tiered fringes are perfect for your goal of, well, getting fringed. There are a lot more Tod’s handbag collections that will surely fit your fashion taste. You can always check out their official website or go to various online handbag sellers all over the Web. We know the importance of getting the newest and latest designs for our customers. For this reason, we strive to offer fresh designs of faux designer bags, backpacks and personal accessories, among others. For this month, we have added several new bags, backpacks and wallets, to name a few, from several luxury brands. Indeed, this is the perfect time for refreshing your collection by adding several chic items to it! You don’t have to worry about getting in the red as we have ongoing promos that offer generous discounts so come now and look at our new collections! We at Purse Blog knows the importance of novelty in our collections. Our customers are demanding and discriminating customers that are always on the lookout for the newest designs in branded bags, wallets and belts, among others – and we are just happy to address their needs and wants in these products. We have new bags from brands like Gucci, Goyard, Louis Vuitton, Chloe, and Hermes, to name a few. What do these products have in common? Every single one of them are so popular that their demands are high! Plus, these replicas are of the highest quality that they look and feel like the real McCoy. The newest additions to our Purse Blog collections include several fake designer bags from clutches to backpacks, as well as wallets. The diversity of our newest additions means that every style preference will meet its match in our collections. But if you’re at a loss about which product to choose, we present a few useful suggestions for your benefit. Tom Ford Handbags and Hermes new models. Fashion Houses with icon Bags and must have it Bag sale!